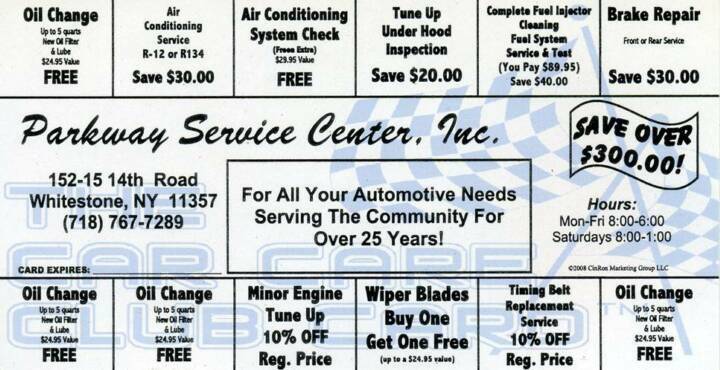 As a 14th Road Parkway Service customer you will be eligible to join our Car Care Club. Your membership is only $89.95 and entitles you to hundreds of dollars worth of savings on the services you need regularly. Just for joining you will receive your first oil change at no charge, including up to 5 quarts of regular motor oil and a new oil filter (synthetic oil and special filters are extra). Savings valid for any car you bring in with your Car Care Club Card. It makes the perfect gift for friends and family . Certain restrictions apply. Contact us for more information or to join.